Our cabinets, countertops, tile for flooring and backsplashes, and thousands of remnants in our facility ensure that we have exactly what you need for your remodel or new build project! Tops Solid Surface completes every project with our customer's great expectations in mind. Once we know how you want to use your space, we'll begin with sourcing the right products for your vision and budget with input from our expert design team. State-of-the-art advanced technology for measuring and fabrication, combined with our knowledgeable craftsmanship and professional installation makes for a successful space that you will love. We invite you to see your project through every step of the way! Established in Olympia, Washington in 1999, Tops Solid Surface works with homeowners, contractors, businesses, builders, yacht and RV owners, and more on kitchen and bath renovation, unique home projects, new construction and remodeling. Tops is proud to be a part of Olympia and the South Sound communities, providing quality products and services to our friends and neighbors, and family wage jobs for our talented team members. Housed in over 20,000 square feet of indoor warehouse space, Tops Solid Surface uses state-of-the-art robotic fabrication equipment, including the Titan CNC and BACA Robo SawJet to precisely engineer natural stone and quartz fabrication with unmatched accuracy. Tops is the only company in Thurston County using this advanced technology. Our facility also holds the area's most impressive selection of materials for you to choose from for your new bath, kitchen or home project. 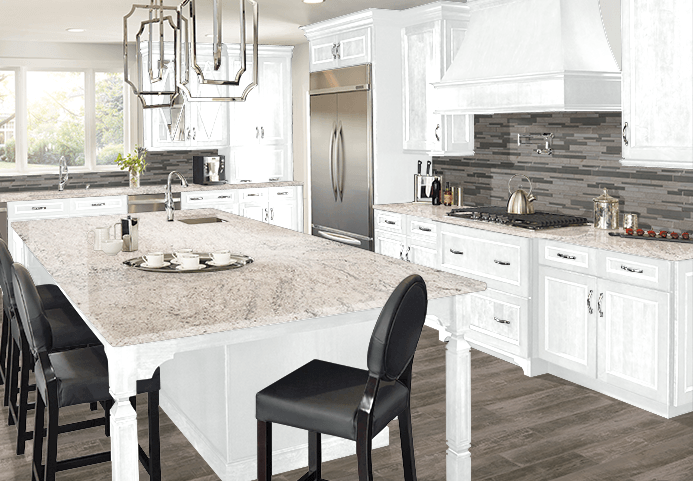 Whether you're seeking the rare and unique stone slabs, discounted stone remnants, or materials made in the USA -- or even right here in our beautiful Northwest backyard -- Tops Solid Surface is your best choice. Since then, Tops has installed thousands of kitchens, bathroom vanities, fireplaces and other surfacing treatments in both residential and commercial applications. Tops Solid Surface continues to be the premier surfacing company in the Pacific Northwest, remaining devoted to the core principles upon which it was founded, a leader in customer service and value. Our water reclamation systems transform our manufacturing sludge into clean water. We harvest local trees only when they have fallen or are being removed for safety or construction purposes. We support Habitat for Humanity and other community agencies including our schools by donating usable materials removed from remodeling sites to reduce or eliminate landfill waste.